CPRJ Direct in Guangzhou :- CPRJ Plastics Automotive Conference and Showcase 2014 grandly opens today in Guangzhou, China. Over 400 professionals from renowned institutes, industry associations and corporations actively participate in information and technology exchanges. Stanley Chu, Chairman of the Adsale Group, one of the conference organizers, gave an opening speech in the morning. He said that Guangzhou is the most suitable venue to organize this conference for two reasons: the city has become one of the automotive manufacturing centers in China; meanwhile, the Guangzhou-based auto maker, GAC Group, has shown the world China can be a competitive force in the global automotive industry. Several experts presented on latest materials development for automobiles during the morning session. One of the speakers, Wan Xinming, Vice General Manager of China Automotive Engineering Research Institute Co. Ltd, highlighted the applications of composite in vehicles, with a special focus on long fiber reinforced thermoplastic (LFT). Based on thermoplastic resins, LFT (glass or carbon fiber between 10-25mm long) reinforced materials show strong impact strength, is lightweight and corrosive resistant. The good molding property and recyclability allow it to be used in many different parts, such as front end module and wheels. Mr Wan said that LFT is widely used in European and Western automotive industry. Being one of the most influential materials in the industry, the Chinese market needs to further strengthen its technological development on composites, such as pelletizing, online molding and recycling technologies. Willem De Vos, CEO of Society of Plastics Engineers (SPE), the conference co-organizer, shed lights on sustainable development of plastics in automotive industry. He pointed out that the use of renewable material is an irreversible trend, and biomaterial is going to replace non bio-based filler, e.g. glass. In addition, the improvement in sorting technology will lead to more efficient recycling. The demand for customization is another major influence in the automotive industry, according to Mr De Vos. It leads to the development of more complex, functional parts, as well as more colorful decorations, which presents huge opportunities for the plastics industry. Xi Zhongming, Vice Chairman of GAC Motor Technical Center spoke on the topic “The rise of GAC Trumpchi – A World Class Vehicle from China”. His presentation covered the growth of GAC and its ambition, its R&amp;D and quality control capabilities, as well as innovative corporate management and online cluster marketing model. The afternoon session of the conference is divided into three different topics: automotive weight reduction, interior decoration and volatile organic compound (VOC) control, as well as exterior decoration and metal replacement in engine compartment. The list of speakers come from renowned auto makers, machinery and material suppliers, including Geely, Arburg, GAC, Borouge, Demag, Kumho-Sunny, Changchun Faway-Johnson Controls, ExxonMobil, Radici Engineering Plastics, Mann+Hummel, etc. A wide spectrum of topics are covered, such as direct long fiber injection molding, green and lightweight material, color and texture of automotive parts, metal replacement solution in engine compartment, and high performance polyamide (PA), to name but a few. All of these presentations lead to one megatrend: emission reduction of vehicles. Networking sessions are organized in between these presentations for attendees to have further discussions. Furthermore, around 30 companies exhibit their latest product and technology, including the display of a new car model from GAC. The conference ends on November 14 with a visit to GAC’s passenger car assembly plant and injection machine supplier Yizumi’s headquarters. 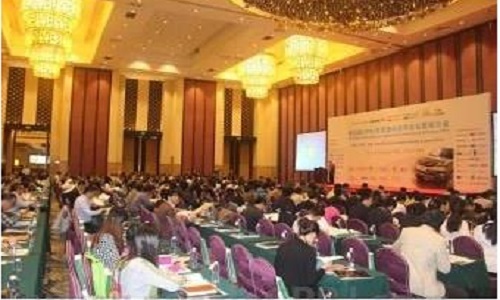 CPRJ Plastics Automotive Conference and Showcase 2014 is organized by CHINAPLAS and SPE, and co-organized by Guangdong Automobile Industry Association and Shanghai Yaxuan Consulting Service Co. Ltd.